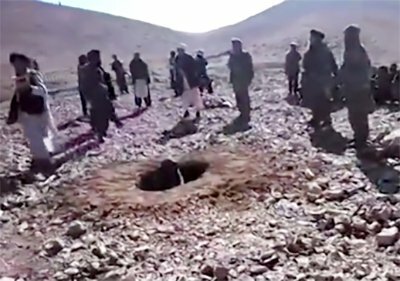 Footages of the stoning surfacing in social media shows the woman in a hole in the ground as scores of violent men casually hurl stones at her. Forced to marry against her will, the woman named Rokhshana was stoned after she was caught eloping with another man in Ghor province, provincial Police Chief Gen. Mustafa said. Rokhshana, 19, can be heard screaming in the disturbing clip. "Taliban ordered stoning of the girl after she was caught eloping with a man on the mountains," he said. "Police has started investigations and will arrest the perpetrators soon." The incident happened a week ago in a village, 40 kilometers from Firozkoh, the provincial capital. The governor Seema Joyenda has also confirmed the stoning and said Rokhshana was "stoned to death by Taliban, local religious leaders and irresponsible armed warlords." According to Joyenda, one of Afghanistan's only two female governors, Rokhshana's family had "married her to someone against her will and she was eloping with a man her age." She strongly condemned the stoning and called on the central government to take actions against the brutal killing as soon as possible. According to her, the presence of more than 10,000 irresponsible armed men in Ghor has caused violation of women's rights. Meanwhile, civil society and women's rights activists strongly condemned the stoning and called it an "unacceptable and unforgiveable act." This is not the first case a woman stoned to death in public. 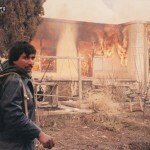 A number of similar cases have occurred in the past during the Taliban regime, ousted in 2001. Since January there have been 36 cases of violence against journalists - a 40 percent increase over last year.